As expected, Punxsutawney Phil saw his shadow a few weeks ago, predicting six more weeks of winter, so we have a little more than a month to go. A North Texas winter is really not much to complain about when I see temperatures that are actually BELOW zero across the country, but we are truly ill-equipped to deal with it. We don’t own coats, our homes are lacking insulation, and gosh darnit, our blood is thinner! So, when I say it’s 29 degrees here today, know that I’m truly suffering. 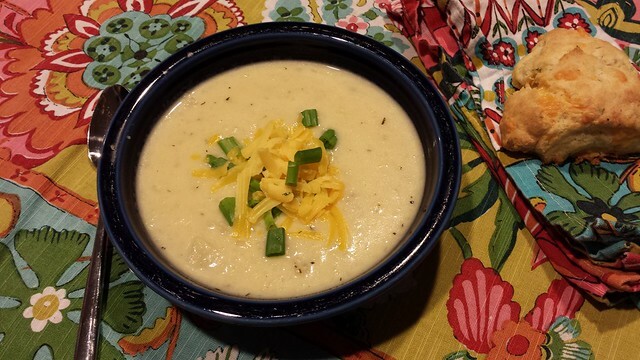 On a cold afternoon when I don’t want to emerge from my blanket cocoon by the fire to make dinner, a warm crock pot full of potato soup is really ideal. This soup is minimal prep, maximum warm and delicious. The lack of meat makes it pretty variable as far as when you want to prep it – it could probably go 8-10 hours on low, or 4-6 on high. I put mine on high for an hour, then 3 on low. You could top it with some crispy bacon if you wanted, but it was vegetarian night at my house (minus chicken broth, obviously). I like mashing half of the potatoes to give the soup some texture, but if you want it all smooth you could mash all of them. 1. Dice the onion, mince or press the garlic, and peel and cube the potatoes. Melt the butter in a medium skillet over high heat and cook the onion, garlic, and thyme until the onion is browned. Add the flour and stir together for a minute, then add 1 cup of the chicken broth and whisk. Pour into the slow cooker. 2. Add the potatoes and the remainder of the chicken broth to the slow cooker and cook for 4 hours on high or 8 hours on low, until the potatoes are soft. 3. 20 minutes before serving, scoop out about half of the potatoes and mash (or rice) them. Stir the cream into the mashed potatoes and return to the soup. Grate the cheddar cheese and add 80% of it to the soup. Stir while the cheese melts. Season with salt and pepper. Chop the scallions. 4. Serve the soup with a little grated cheese and scallion on top. « Cheese Blintzes for Sochi!